One Bank Limited Bangladesh has published a job circular for the post of Cadre Officers (5th Batch). 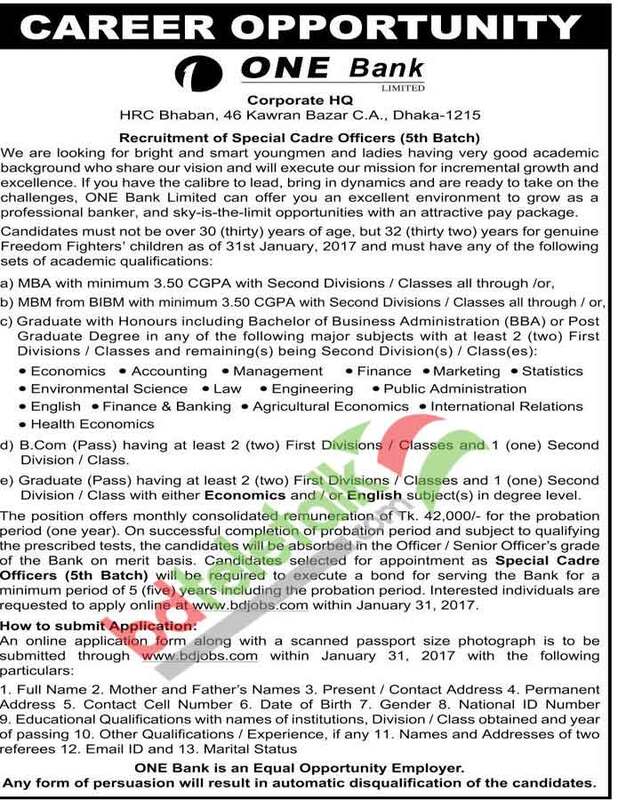 The One Bank Ltd job circular published on Daily Star newspaper on 1st January 2017 and BD Jobs online. You can apply online via www bdjobs com. Bellow you have to see the details of this Cadre Officer job of One Bank Ltd.
One Bank Ltd are looking for bright and smart young men and ladies having very good academic background who share our vision and will execute our mission for incremental growth and excellence. Candidates must not be over 30 (Thirty) years of age, but 32 years for genuine Freedom Fighter’s Children as of 31st January, 2017 and must have any of the following sets of academic qualifications. C. Graduate with honours including Bachelor of Business Administration (BBA) or Post Graduate Degree in any of the following major subjects at least two First Division/classes and remaining being second Division/Class. Economics, Accounting. Management, Finance. Marketing, Statistics, Environmental Science, Law, Engineering , Public Administration, English, Finance and Banking, Agricultural Economics, International Relations, Health Economics. D. B.Com (Pass) having at least 2 First divisions and 1 second class/division. E. Graduate (Pass) having at least 2 First divisions and 1 second class/division with either Economics and /or English subjects in degree level. The position offers monthly consolidated remuneration of Taka. 42000/- for the probation period (one year). On Successful completion of probation period and subject to qualifying the prescribed tests, the candidates will be absorbed in the Office/Senior officer’s grade of the Bank on merit basis. Candidates selected for appointment as Special Cadre Officers (5th batch) will be required to execute a bond for serving the Bank for a minimum five years including probation period. Interested individuals are requested to apply online at www bdjobs.com within January 31, 2017. An online application form along with a scanned passport size photograph is to be submitted through www bdjobs com within 31, 2017 with the following particulars as per required on application form. Here we will update One Bank Limited Job Cadre Officer written exam result, Admit Card and Seat plan. Within very short time written exam date and time will publish on this page via www onebank com bd. Finally viva voce and date and selected candidates list will update on this page as well. bdjobs com/obl. one bank special cadre officer written test result. one bank special cadre officer result. one bank admit card. www bdjobs com/obl. one bank result 2017. one bank result. one bank job circular. one bank special cadre officer. bdjobs/obl. one bank sco result. www onebank com bd. when will the result be published of the written exam?